It’s a real pleasure to finally bring you the wedding of RMW Real Bride Sophie this afternoon. From the very start of Sophie’s wedding planning journey, we had an inkling that her wedding was going to absolutely gorgeous…and we were right. It’s SERIOUSLY beautiful and most definitely worth waiting for. 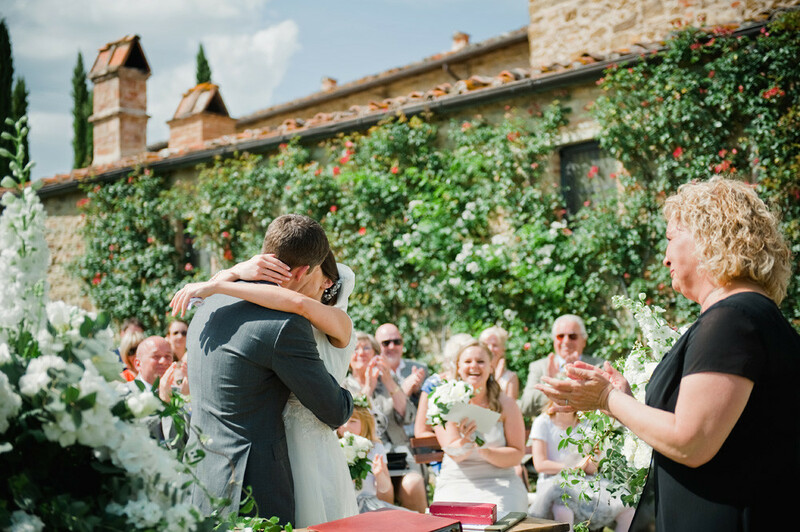 In her very first post, Sophie listed the four things that she and Simon felt were most important for their wedding day – a beautiful venue in the heart of the Tuscan countryside, delicious local food and drink, gorgeous white, ‘poufy’ flowers and timeless, to-die-for photography…and as you’ll see, they ticked off all four boxes to perfection and had a truly beautiful day. Wedding Film Studio | Simon & Sophie's Wedding from Wedding Film Studio on Vimeo. RMW Real Bride Sophie: Hi everybody! Well it’s official; we are now Mr & Mrs White! I can’t believe it’s already been 8 months since the wedding, and let me start by saying how proud I am to finally call Simon my husband. Our wedding was everything we hoped it would be and more, I honestly don’t know where to begin to tell you all about it. 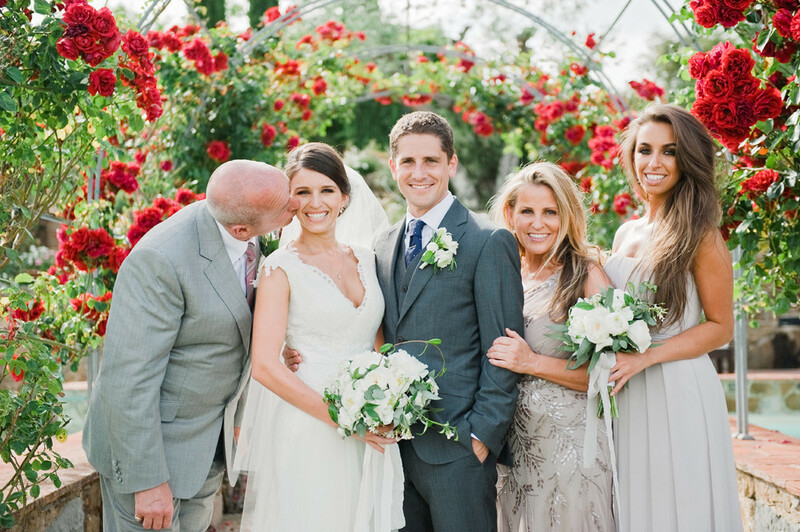 It was a truly sensational weekend full of love, laughter…and plenty of Italian wine! Help, I seem to have planned a festival! The fun and games arrived from the moment we arrived in Italy, 5 days before W-Day. Now, for the destination wedding brides out there, be warned – prepare to work hard! I promise you that it will all be worth it, but my goodness it’s a crazy amount of work. You may remember from one of my earlier posts that Casa Cornacchi lends itself to being a bit of a blank canvas. It offered abundant opportunities for us to make the wedding our own, but I don’t think I truly appreciated what I’d taken on until Friday morning when huge vans started rolling up the hill loaded with marquees, tables, chairs, linens, sound equipment, lighting, outdoor furniture, and a LOT of wine; all accompanied by many delivery men who just looked at me as if to say “where do you want it?” – it suddenly hit me…I’d planned a festival! Anyhow, 4 hours, 3 marquees and 2 sound checks later, the venue was looking fantastic, just in time for our guests to arrive. How amazing it was to see all of our family and friends in one place, and a glorious place at that! 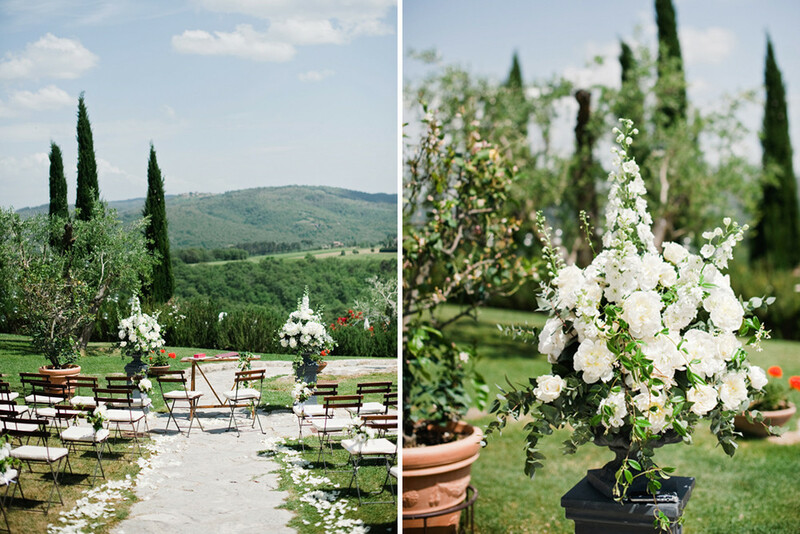 Casa Cornacchi was in full bloom and the rolling Tuscan hills that framed us looked dreamlike in the sunshine – it was our little piece of Italian heaven and everyone was blown away by the beauty of the house and its setting. The wine was flowing, the delicious fresh pizza kept on coming, the kids (and even a few bigger kids!) were having a fab time in the pool, and my Dad, true to his word, kept the party rocking with some vintage tunes. And for anyone who hasn’t experienced a party that includes your Grandma ‘getting down’ to No Diggity…well I highly recommend that you rectify that at your earliest convenience! Outstanding! After a perfect first night with our guests, we couldn’t quite believe our luck that we still had 2 more days to enjoy with such a brilliant group of people, starting with the Stag & Hen activities the next day. The ladies headed to Siena for an afternoon of cookery with ‘Mama’, otherwise known as the wonderful Lella, who along with her team instructed us through a masterclass in pasta making and other local delicacies. Pasta was rolled by everyone from ages 4 to 74; it was the perfect opportunity for everybody to get to know each other. And my goodness was it delicious to eat! We enjoyed the fruits of our labour with some local wine over lunch, and it was so heartwarming to see everybody bonding and making new friends. After the class, it was a short stroll to Piazza del Campo (the main square in Siena that is famous for the annual horse race) for espressos, ice cream, and some site-seeing. Perfetto! Meanwhile, the boys were tearing up some tarmac at a go-karting track. Nestled in the middle of the countryside, they spent the afternoon well and truly disturbing the peace. I’m told that in true Italian style the “safety briefing” involved being handed a helmet along with a recommendation not to crash! There was a little controversy that the ending podium featured a ‘White’ in positions 1, 2 and 3, and I’m told that there were strong suspicions of a fix – something which the White family strongly denies… 😉 After the go-karting, the boys headed back to the venue for an afternoon of lounging by the pool with some beers, and I have to say that coming back from Siena to see all of the boys laughing and joking together was an amazing feeling. It was probably the first moment where I really allowed myself to relax and feel proud of what we had achieved. We were both on a high after a brilliant afternoon. It was right at this moment that we were reminded of the day that was still ahead of us, with the arrival of our photographer Dominique Bader and her husband Samuel. Now I have to confess, I was a little star struck to see Dominique in the flesh! I have been a stalker of her blog for more years than I care to admit. 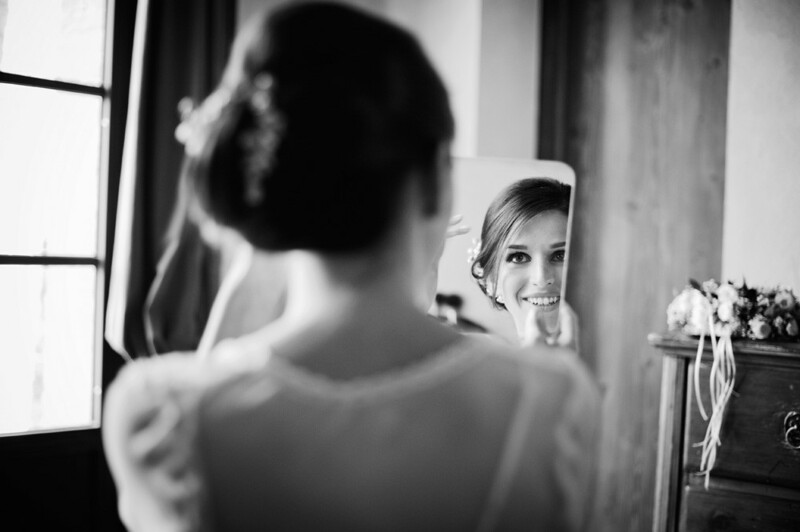 She was my one and only choice to capture our wedding, and to actually have her there at Casa Cornacchi was so exciting. We spent a lovely half hour exploring the grounds of the venue and showing Dominique some of the possible locations for photographs. Just as we finished, right on cue, our videographer Simon of Wedding Film Studio arrived. The decision to have a film was a relatively late one for us. Like many couples we umm’d and ahh’d over whether it was really a necessary extra cost, but I can honestly say it was one of the best decisions we made. The video that Simon created is absolutely beautiful and something we will treasure forever. He captured the feeling of the day perfectly, but also incredibly discreetly. I have watched it countless times already! If you are in 2 minds about getting a film, please, please do it! After a fabulous BBQ dinner and a quick family team meeting to finalise the plans for the big day, all too soon it was time for Simon and I to go our separate ways. This was more emotional than I’d anticipated. I have to be honest, as extraordinary as the day had been I was definitely starting to feel the pressure for what was to follow. The amazing first 2 days had only given me more desire for the wedding day itself to be really special. And the truth is that I was nervous it just wouldn’t live up to expectations. I think a lot of it was just the stress of what Simon and I had been through in the months leading up to that day – after 19 months of all-consuming, trans-Atlantic planning, suddenly it was here! There was no reason to expect it wouldn’t go off without a hitch, but by this point we were also pretty exhausted and frankly just ready to let go of the endless lists and spreadsheets and finally enjoy our day, so it was pretty tough to say goodbye to each other on a night when we really wanted to cling to each other for support. But we were determined to stick to the tradition, and so off Simon went to spend the night at his brother’s apartment while my sister and I went to get everything ready for the next day. I distinctly remember what a lovely peaceful time that was, just quietly laying out my dress and accessories in preparation. We crawled into the big 4-poster bed like 2 kids on Christmas Eve, gazing up at the dress that hung from the posts in front of us. We were relaxed and finally ready for the day I had been dreaming of for as long as I can remember. Morning broke and I was awoken to my Mum creeping in to my room. There were more than a few tears as it hit us all that the day had finally come. Cue Anna and me jumping up and down on the bed! It was a really special moment, and the first of many to come. The chaos and madness was only just beginning, starting with a more-than-a-little-bit nerve wracking time spent ironing my dress and veil after my steamer went on strike! Perfect timing, eh? So I can finally tell you all about my dress! You may remember from my post on the big dress hunt that I was struggling to choose between 2. I had always expected to go for a fitted trumpet style dress in full lace. The last thing I expected to go for was tulle, but when I tried on an Annasul Y dress that featured a fitted lace underskirt, a lace keyhole back and an overskirt of the softest tulle, it just felt right. I loved how the tulle moved and draped down the sides of the dress, allowing the lace to peep through. It felt elegant and timeless but romantic too, especially when we added the beautiful lace-edged veil. The only slight problem with a dress that featured a ridiculous number of layers of tulle was that it inevitably creased during the travelling. Add in a cathedral length veil, and you have a whole lot of steaming ironing to do! I cannot tell you how nerve wracking it was taking an iron to my dress and veil. We all held our breaths, but luckily it worked out perfectly and a mere 2 hours of ironing later (oops! Thanks Mum!) it was looking perfect. Up to this point in the morning I was feeling pretty relaxed. I wasn’t overly excited or even nervous; I was just thinking through the morning and taking the occasional peek out of the window at the ceremony space being set up right outside our little cottage. The calm and serenity didn’t last long though! As soon as my bridesmaids arrived, closely followed by the hairdressers, my excitement level shot through the roof. This was it! All systems go! My wonderful hairdressers, Nello and Sandy, got to work on the bridesmaids and my sister was a superstar in helping to get them all made up. The girls wore beautifully elegant floor-length chiffon dresses by Dessy and I gave each of them a set of black pearl necklaces and earrings, which we bought during a trip to Hawaii the year before, and a pearl brooch to secure the sashes at the back of their dresses. It was a little touch that really looked beautiful against their dove grey dresses.They all looked absolutely stunning! Once the flower girls arrived it really was a full house! We had 4 flower girls and they were the cutest little girls in the world. They wore beautiful dove grey tutus and crowns of gypsophila and roses in their hair! By this point, the Prosecco was flowing, the excitement was building, and things were about to get a whole lot more exciting when my Mum delivered a gift from Simon. It was the most stunning diamond necklace and earrings set. I couldn’t get over how beautiful they were – many tears were shed! Thankfully, my sister hadn’t started on my makeup by this point! I wore them with such pride that day, and they set my dress off beautifully. ‘Spoiled rotten’, comes to mind! With the bridesmaids and flower girls looking fabulous, it was my turn in Nello’s hot seat. I had set him a bit of a challenge with my hair piece – a stunning custom made hair vine designed by Erica Elizabeth featuring pearls, silver leaves and tulips enameled in white, plus a few sparkles for good measure. There was no easy way to fix it into place as it was pretty heavy, but Nello wove it through my hair beautifully. Finally, my sister got to work on my makeup and before I knew it I was preened within an inch of my life and ready to get into my dress. Dominique had the fantastic idea of getting dressed outside, to make the most of the beautiful backdrop of trees and hills behind the cottage. It was totally private, but what made it even more special was being able to hear the music playing just around the corner. I’d chosen a selection of string and piano songs to play while everybody was milling around before the ceremony, and it was dreamlike being able to hear the music and the buzz of our guests just a few steps away while my Mum and sister were helping me into my dress. It was also at this moment that my bouquet was revealed to me. Nadia and her team at Stiatti Fiori nailed it! It was a perfect all-white “poufy-o” bouquet of blooming peonies, ranunculus, roses, honeysuckle, rosemary and eucalyptus leaves. It smelled divine! With everyone ready to go, it was time for the big reveal to my Dad. 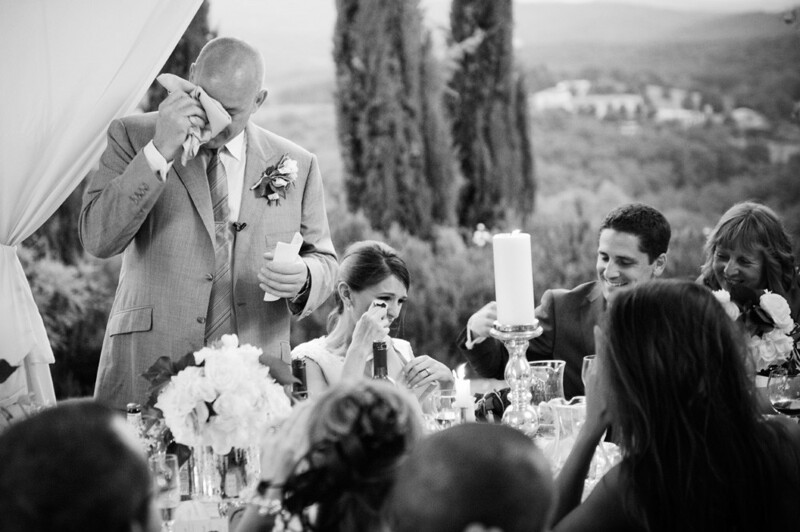 This was such an emotional moment – we both sobbed! It was one of my favourite times of the whole day and I’m so thrilled that we had it captured in the photos and film. There was just enough time for a quick glass of Champagne with the girls and finally it was time to go. The time really does fly by ladies – make sure you give yourselves plenty of time to get ready! As we headed around to the front of the cottage, the sounds of Ludovico Einaudi’s ‘Il Giorni’ started up and our eldest flower girl, Charlotte, started leading the procession down the aisle. With a few deep breaths to steady my nerves, a squeeze of my hand by Dad, and it was my time to go. Seeing everybody turn around to look at you is a surreal feeling! It took everything I had not to cry – especially when I saw how incredible the ceremony space looked with all of the beautiful flowers and candles hanging in the olive tree – but I was determined not to sob my way down the aisle! Eventually, after what felt like forever, Simon turned to look at me and I just felt pure happiness. He looked so handsome in his 3-piece suit (which must have been a killer in the 30 degree heat!) and at that moment, with those amazing hills in front of us and so many people we loved there with us, the hard work and stress over the past 19 months was all worth it. At long last, this is what we were here for. Our celebrant, Jo Bertolino, was beyond wonderful! The ceremony was so touching and personal that I was barely able to hold back the tears throughout the whole thing. So much for holding it together! We had 2 readings, delivered beautifully by 2 of the bridesmaids. Baby Jo was first with An Extract from Captain Corelli’s Mandolin –a classic and one of my favourite books ever. Our second was a Dr Seuss piece called ‘Oh The Places You’ll Go’, delivered perfectly by Joely despite being a little tongue-twisting in places! It brought a lighthearted touch after the more sentimental note of the first reading. After exchanging rings, we were finally pronounced man and wife and the deal was sealed with the all-important kiss! The sounds of Jamie Cullum’s “I get a kick out of you” started up, and we headed back up the aisle through a cloud of rose petal and lavender confetti. The next hour was such a high. It was a whirlwind of hugs, kisses, Prosecco, congratulations, more Prosecco, delicious canapés, and I seem to recall there being some Prosecco. God bless those Italian vintners, they know what they’re doing! But we needed it just to keep us cool (that’s my excuse and I’m sticking to it…) Yes, it turned out that the weather man had once again got it wrong – thank goodness! After forecasting a whole weekend of rain, we were blessed with glorious sunshine. Quite literally, a nice day for a ‘White’ wedding! 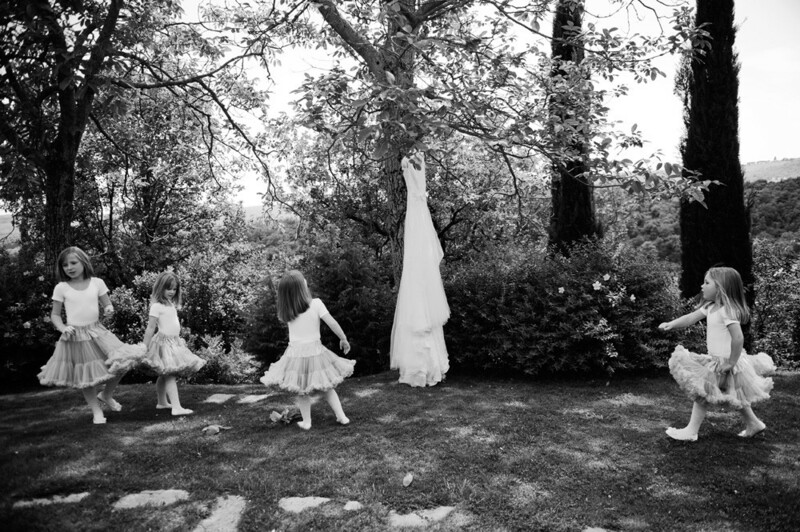 The flower girls dealt with the heat perfectly – the second the photographs were over it was dresses off, swimming costumes on and straight in the pool! Frankly, I was tempted to join them! I think living in Houston had been good training for my husband (ahem, he he!) because he stuck it out in his 3-piece suit with aplomb, despite people saying that they felt hot just looking at him! And I honestly don’t know how our videographer did it – he was packed with so much equipment that it must have been exhausting in that heat. Our poor photographer Dominique suffered for her craft too, particularly during the group photos when she had to stand face on in the blazing heat, but my goodness did it pay off – the photos were so much more than we imagined, and having followed her work for so long, that’s saying something! She completely nailed it. They blew us away and I can’t imagine anyone could have captured our day better. After the hectic time of pulling everyone together for group photos, it was bliss to disappear for our portrait shots. This was frankly unexpected! We really didn’t know how much we’d enjoy being photographed so intensely, particularly because neither of us is all that comfortable in front of a camera. But we trusted Dominique implicitly so we wanted to give her free rein to just do her thing. And my goodness we are so glad we did! This turned out to be one of the highlights of the day for us – it gave us time to just be with each other and take everything in. We were only a stone’s throw away from our guests so we could hear the hum of the music and everybody enjoying themselves, while also feeling like we were enjoying a private moment…despite the 2 cameras that were on us! It was magical. And the beauty of already having spent 2 days with our guests was that we didn’t feel in such a rush to get back to everybody. 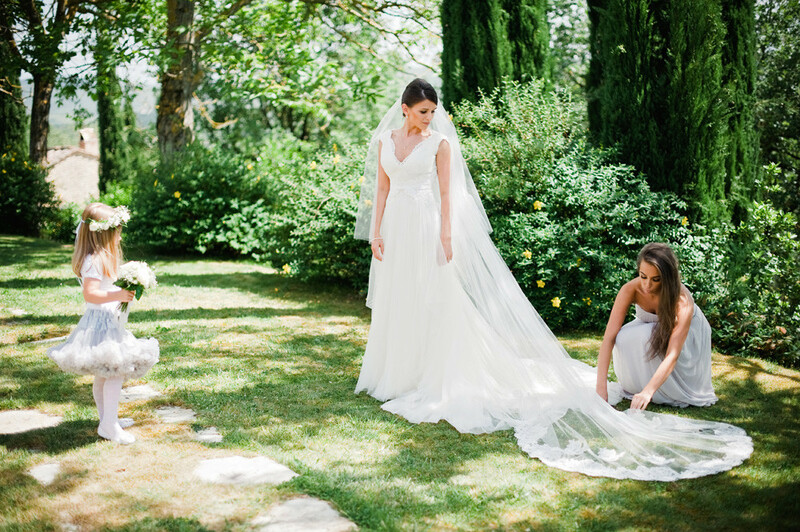 This was a moment just for each other, and the end result was the most fabulous shots of us among those stunning olive groves that we’ll treasure forever. Before we knew it, it was time for dinner. The reception marquee looked absolutely incredible. Our families had worked so hard all morning to pull it all together, and they really had done us proud. It was exactly how I pictured it and more. I’m told there were more than a few panics in the morning, firstly when they realized that the table plan we’d had spent days agonising over wasn’t going to work because it would have had Simon and I sitting with our backs against a marquee post (not the best backdrop for photographs during the speeches!) so there was a reshuffle required. And everyone was apparently in a mad panic when the florist hadn’t arrived 90 minutes after her scheduled time. Of course, in true Italian style, she arrived exactly when she meant to! The day was so hot that she worried about the flowers wilting so wisely decided to leave it as late as possible to set up. It all came together in the end, but I can’t deny that I’m glad they kept all of this from me on that morning – I’d have been a wreck! Stiatti Fiori blew me away once again with the flowers for the marquee, which were bravely holding on despite the heat. The sumptuous white blooms were complimented beautifully by the dove grey table runners, the Italian herb table names hand-painted beautifully by Momental Designs, and the hundreds of mercuried silver candle holders I’d spent a year collecting and brought over with us from Houston. Everybody’s place setting was dressed with glass chargers, sprigs of lavender and rosemary wrapped in gorgeous dove grey silk ribbon (Lolly – I hold you responsible for my obsession with that FrouFrou Chic ribbon!) and a name card which we printed on the back with the meanings of everybody’s names, some of which were hilarious in their irony! It was the perfect blend of rustic elegance that we’d been aiming for all along. Casa Cornacchi served up the most delicious food showcasing the best of the region’s delicacies, and all the while we feasted we were also entertained by the pastry chefs who were constructing the most delicious wedding cake before our eyes. Finally, the speeches were upon us. Now it’s safe to say that by this point Simon was feeling a tad nervous…ok understatement, he was as white as a sheet! You may remember him discussing his nerves about the speech in our last blog post and his plan to partake in some Dutch courage…the only problem being that he doesn’t drink! His master plan to ‘practice’ drinking in the run up to the wedding didn’t exactly go to plan. Well basically, it just didn’t happen at all. But with 10minutes to go before he was due to stand up in front of our nearest and dearest the pressure was getting to him and he felt drastic measures were in order – instructions were given to get him a gin and tonic! Which my Dad did – happily – and it turns out it was a rather large one! The transformation was incredible! Now maybe it was a placebo effect, or maybe the gin really did work, but his speech was flawless. As soon as he stood up and confessed that he’d just had his first ever drink the crowd went wild and he had the audience in his hands. Now I may be bias, but what ensued were 3 of the best wedding speeches I have ever heard. My Dad, the best man Tom, and of course Simon all did so well, and I’m so glad that we have them all on film to enjoy over and over. By this point we were running late and I felt pretty guilty about keeping the photographers and videographer there for too much longer. 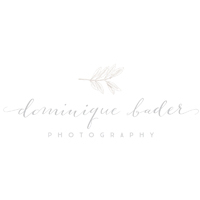 The only thing left for them to capture was the first dance, but knowing how long all of that tulle took to bustle up meant there was only one thing for it – throw the train over my arm and dance on! The band started up and sounds of Frank Sinatra’s ‘The Way You Look Tonight’ welcomed us onto the dance floor. 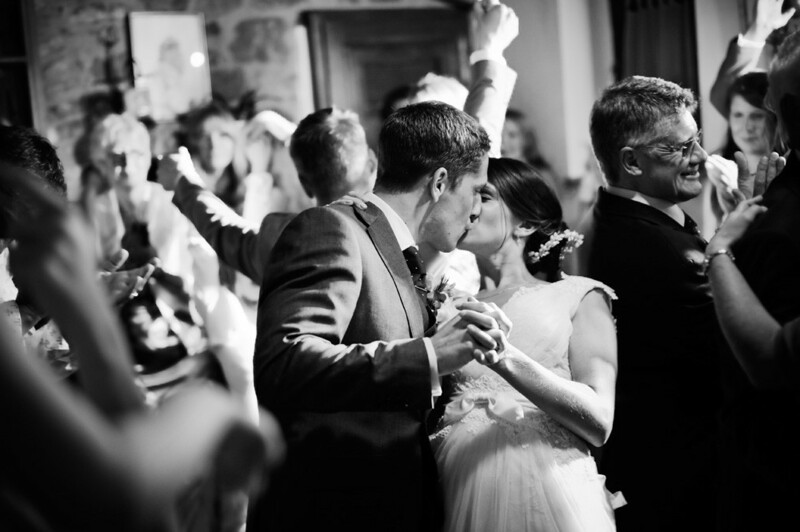 It was another perfect moment – even if our moves were slightly hindered by my dress! The whole weekend was an exhilarating, joyful, hectic, chaotic, love-fest and we couldn’t have asked for anything more. The international element of our planning had often been stressful, but it paid off in abundance. So my final message to you ladies is this – hang on in there!!! I know there are times when the planning is stressful and Gretna Green starts looking seriously appealing. But I promise you the hard work will pay off. And that feeling when you wake up the morning after the best day of your life, finally married to the man you love, well there’s only one word I can really think to describe it – victorious! And this is only the beginning? Well then, bring it on! Those speeches on the video are just adorable & I’m not ashamed to say I shed a tear. I wish you both a lifetime of happiness. Congratulations Sophie & Simon, gorgeous, gorgeous wedding & couple. We’re all really excited for your wedding too Kate!! I’m sure it will be absolutely beautiful – Sophie’s big day hopefully has been an amazing source of inspiration for you. Thanks Fern!! I’m def going to use some of these beautiful photos to inspire me. 🙂 Perfect is the perfect word for it! Thank you, thank you, thank you soooo much Lorna and Kate!!! Your words were amazing and so kind. It was a really amazing day. Kate, so excited for you that you’re getting married in Siena! I’m sure you’ll have an amazing day. It’s such a beautiful place to get married. Awww Sophie, we’re not supposed to have favourites, but you’re definitely one of them!!! It’s so lovely when our Real Brides make friends, hopefully that’s what the RMW community is all about! Thank you so much for your lovely words Elizabeth! That’s so kind of you. Seriously girl, you are beyond talented. Kate is right and it does look like a photoshoot, but it is so jam packed with humour, love and friendship, that a photoshoot could actually never really look this good!! What a truly beautiful wedding, can I just ask Sophie what eyeshadow are you wearing, the colour is beautiful. Enjoy married life! – Ebony and Kid under the eye. Oh gosh, how beautiful. I echo Sinatra ‘The Way You Look Tonight’, what a perfectly fitting first wedding dance song. Congrats! Congratulations Sophie, such a beautiful wedding!! I hope you don’t mind me asking but would you share your total budget for the day? I’d be happy to talk you through it but there are a few specifics that you should probably be aware of if looking at just a total figure. If you want to email me at s.cecchini6286@hotmail.co.uk I can let you know. I love your photography – what amazing photographs. The colour image are so vibrant and fresh. Love the contrast of the black and white images. Dear Sophie, Your wedding looks like a dream. Really truly beautiful! I am due to get married in Italy in August and was wondering what band you used? I am finding it hard to get one. 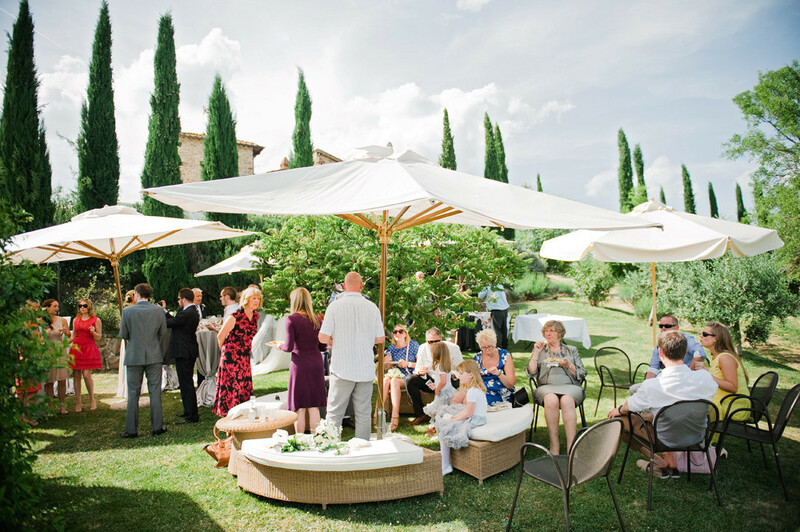 I know how tough it is planning a wedding in Italy so I am even more impressed by the incredible day you created! What a beautiful wedding! It was actually seeing your RMW photos and video that inspired me and my fiance to visit Casa Cornacchi. We’re getting married there in April 2017. I was wondering who you chose to do you catering? Our family and friends (us included) are massive foodies so the food is really important to us. I was wondering who you used and if you could recommend any caterers to visit? Hi Sabrina. If you’d like to email me I’d be happy to provide some more information on flowers that might be helpful. My email is s.cecchini6286@hotmail.co.uk. Thanks! 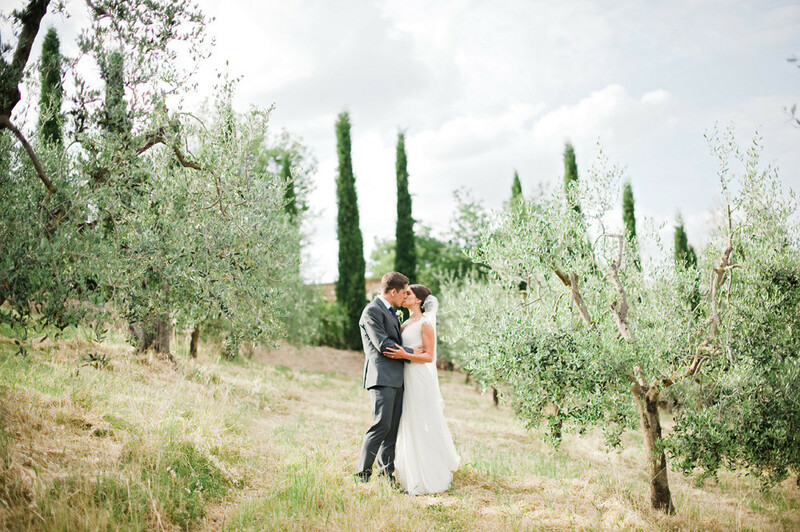 Your wedding looked beautiful and was the inspiration for us to travel to Tuscany 2 weeks ago and look at a few places. Barbara was so lovely and we have just booked Casa Cornacchi for our wedding there next May! I feel a bit overwhelmed now about where to begin now with all the details but I had a few questions I was hoping you would be able to help me with, would you mind if I got in touch? I found Casa Cornacchi from Sophie’s blog also and am also looking to book without going out because we can’t make it out until next month!! I’m such an OCD Perfectionist Control Freak that I’m planning to do it all without a planner. Are you both thinking the same or am I crazy? Hi Rabs – same comment as to Kimberly (not sure if you get alerted since I seem to have responded to both of you? But just in case!) I’m so sorry I only just saw this. If you still would like to get in touch please feel free – s.cecchini6286@hotmail.co.uk. Thanks! Hi Kimberley! I’m so sorry I only just saw this. I thought I was receiving alerts on comments on the blog but I guess not. If you still would like to get in touch please feel free – s.cecchini6286@hotmail.co.uk. Thanks!